Hugs are the universal communication medium for most animals. It may surprise you to discover that I hug all my animals on a regular basis. The reasons for hugging my animals are many, but from the animal’s perspective, it’s a matter of knowing that I’m OK—that I’m not going to hurt them. To keep an animal tame and workable, you need to respect its need for contact with you. Often, people have problems working with their animals because the needed relationship simply isn’t there. 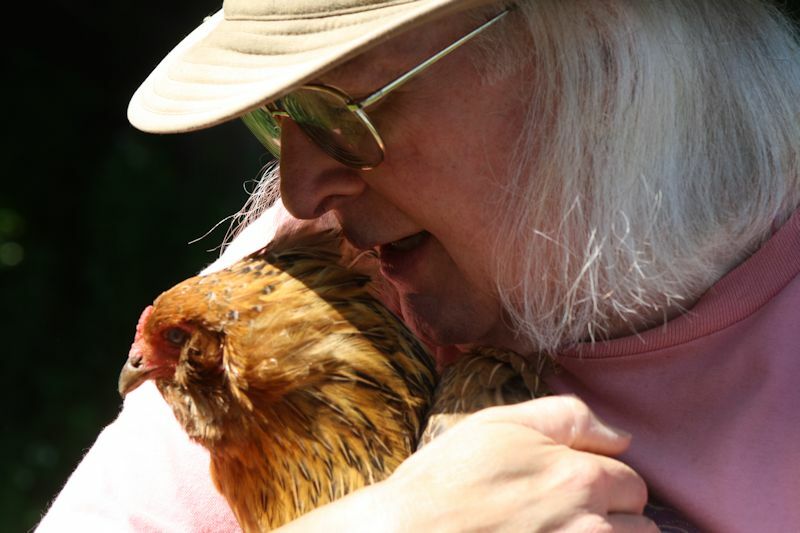 Here’s a picture of me hugging one of my chickens, Daisy. The chickens are actually quite interesting because they curtsey to attract attention and tell me that they want to be picked up. The curtsey is kind of a half bow where they spread their wings slightly as if lifting out a dress. The point is that the hens really do want (and need their hugs). The rabbits also need hugs and have a different way of demonstrating the need. One of my rabbits, Twilight, will sit on her hind legs and raise her front legs in greeting when I open the cage in the morning. If I don’t pick her up and pet her, she stomps her back feet when I leave to show that she’s really quite unhappy. It doesn’t have to be a long hug, just as long as I tell her that she’s special in her own way. My two dogs, Reese and Shelby, want their hugs first thing in the morning, when I let them in from going outside. Each dog has her own way of getting petted. Shelby is quite dignified about the whole thing and sits patiently waiting until I pet her. A little nuzzle often tells me that her patience is running out. Reese is quite crazy and runs about in circles until I invite her over for a hug. Of course, it’s not enough to simply pet her back, she wants her belly petted as well. Every morning Sugar Plum wakes me up by meowing at me and patting my face. 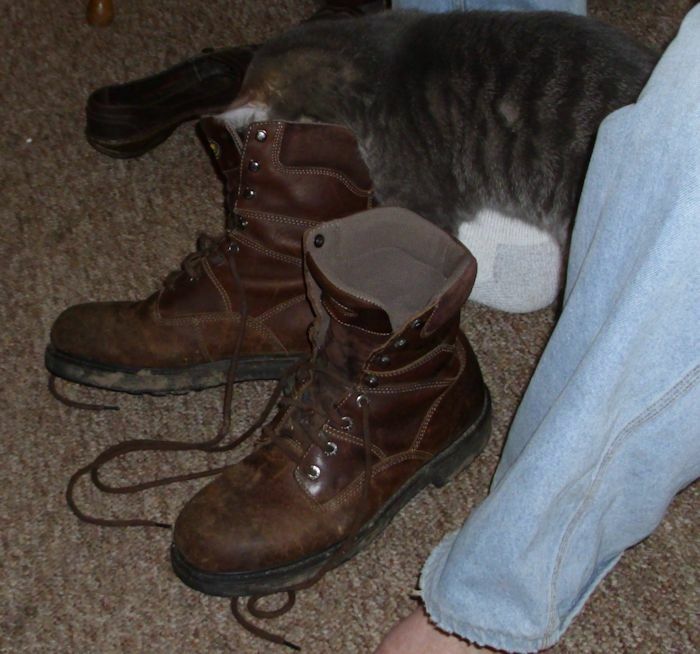 If that doesn’t work, she gets Smucker involved (he stomps all over me). Failing that, the two cats get the dogs stirred up. All that howling, baying, and barking is impossible to ignore. Obviously, Sugar Plum wants to be paid for her efforts, and her hug is a required part of the payment. Smucker usually comes in after breakfast, sits on my shoulder for a while, and then sort of slides down into my lap for his hug. Of course, the hugs don’t just help the animals. Hugs come with serious health benefits for humans too. I’ve noted that my mood improves after my hugs each day. The results are measurable too. Taking my blood pressure before and after a hug shows that it goes down every time. Lower blood pressure and heart rate will help me stay healthy and all it takes is a simple hug. Some people might question whether my animals really do require hugs, or whether I’m anthropomorphizing natural behaviors that mean something else. At one time, I might have thought that animals really didn’t need the hugs—that their behaviors really did mean something quite different, but time has taught me that they need love too and a hug is one of the best ways to give it to them. Let me know your thoughts on hugging your animals (or hugs in general) at John@JohnMuellerBooks.com. I’ve always appreciated the ability of animals to make bad feelings better. There always seems to be something interesting going on with animals that makes the day more pleasant and happy. Of course, there is an almost continuous array of bird song in our area during the daylight hours. Just the happy song of birds is enough to make me smile. When the native birds add antics to the mix, I sometimes get a good laugh in as well. Such is the case with a little downy woodpecker that visits the feeder near our house. He never seems to arrive right side up. No, despite his best efforts, he always seems to hit the perch upside down and must fight his way to an upright position. The vibrant mix of colors doesn’t help the woodpecker’s cause—he looks a bit like a clown anyway. Our particular downy woodpecker seems to have a bit more head color than pictures I see online show, but far less than a red headed woodpecker. Now, when you mix native birds with chickens, you really get a visual treat. In most cases, the chickens try their best to ignore the native birds because they’re obviously better (at least, as far as the chickens are concerned). However, the other day the chickens didn’t have much choice in the matter because some sparrows decided to have fun with them. Imagine this scene for a moment, chickens running madly about flapping their wings and clucking crazily while sparrows are dive bombing them. I laughed so hard that it took several minutes for me to compose myself enough to come to the chicken’s aid. In a contrast to the antics of the chickens, our rabbits are lovers, not fighters. They often need a hug. At the top of the hugging list is Twilight. She always wants a hug whenever I open her cage to feed her. In fact, she actively pursues hugs every time I walk by. She does this odd sort of clapping motion to attract my attention by sitting on her hind feet and moving her front paws back and forth. Entertainment isn’t something that happens just outside either. Our dog Reese is hysterical. For one thing, she can’t go anywhere in a straight line. She runs in circles every time she goes from one place to another. When she’s excited, she mixes the frantic circles with a mix of barking and baying. How any one dog can look so happy and absurd at the same time is amazing. Whenever Shelby (our other dog) senses that I’m blue, she offers me a paw. She’s not really looking for a handshake. Instead, she wants me to hold the paw—possibly for as long as I need to do so. So, I hold her paw and she washes my hand. It’s therapeutic, even if it does get a bit wet. Another washer is Smucker who offers kisses by the gross. He likes to lean into my side and then wash my arms, hands, or other exposed body parts. Of course, the bath comes complete with purring. Finally, Sugar Plum is absolutely frantic about getting petted. She’ll keep nuzzling me until I pet her (and keep petting her until she’s satisfied that I’ve petted her enough). Her purr is a bit louder than Smucker’s purr (as is her meow). All of these behaviors (and many others) serve to help keep my calm and feeling good. I can actually measure a change in both blood pressure and heart rate after interacting with the animals. Many medical studies have noted similar results with other people, so I’m definitely not alone. The point is that animals provide benefits far beyond companionship and laughter. They also make it easier for people to deal with a host of problems in their lives. Let me know about your health benefit experience with a pet at John@JohnMuellerBooks.com. Our animals amaze me at times. We let the chicks out of their sheltered environment the other day and into the larger cage we use to raise them until they’re large enough to go outside. As part of that process, we introduced Shelby to her charges for the first time. Each year Shelby, our border collie, takes care of our meat chickens for us. The process of introduction is important because she has to understand that the chickens are her job, and not something to play with. Getting Shelby used to the idea of herding chickens instead of sheep took a little while, but not too long. We got their scent on her so she would associate their scent with something to be protected. Then we introduced a chick under highly controlled circumstances and praised her when she sniffed the chick, but didn’t do anything else to it. We then allowed her to nuzzle and move the chick into a protected area. Again, this all has to do with her herding instincts and getting the idea across that those chickens are her job. Border collies have a strong need to be helpful and to feel they have a task they need to do. The first year we tried raising meat chickens, we did it without dog support. It was a nightmare. The first night we put the chickens out thinking the chicken tractors would keep them safe. Quite a few were gone by morning because raccoons had damaged the cage, gotten inside, and partially eaten a number of them. With stronger mesh in place, we thought our troubles were over, but the third night a weasel got in by digging under the tractor and bled half the chickens to death. Out of 75 chickens that year, we processed perhaps ten or fifteen—the rest were killed by animals. It was an eye opener for us. If you live near a woods, use chicken tractors to give your chickens a lot of freedom, and don’t want to spend your nights guarding the chickens, you really do need to train a dog. 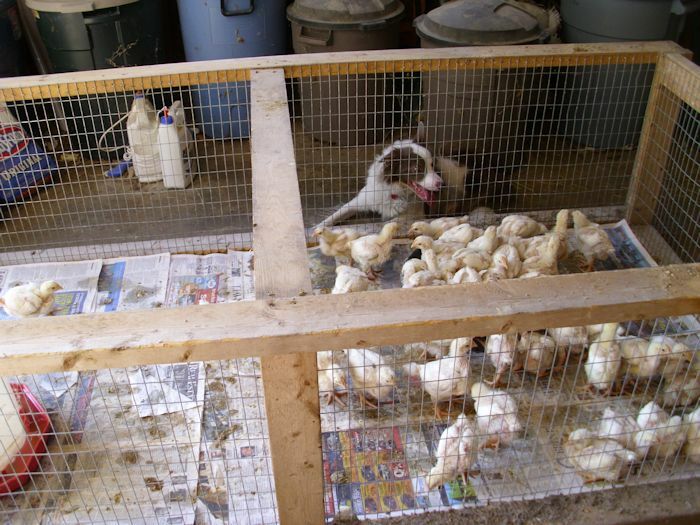 The second year we trained our first dog, Jif, to take care of the chickens. Now, Shelby has the job. She starts her shift protecting the chickens by viewing each one quite carefully. She paces back and forth, looking each chick over. After she is satisfied with the state of the chicks, she lays down but doesn’t take her eyes off of them. During the evening, she’ll get up and check the chicks fairly often. If anything goes wrong, she makes quite a ruckus until we get there to see what is wrong. Once we put the chicks (now chickens) outside in the chicken tractors, Shelby will stay with them all during the summer months. Every night she’ll assume her post to watch them intently. She does come into the house during the daylight hours because we can watch the chicks then and we’ve noted the dog won’t sleep on duty. She comes in each morning quite tired and sleeps most of the day. We do provide her with a house outside, but she seldom (if ever) uses it to gain protection from the elements. What we’ve noted is that she puts anything that she has caught trying to get to the chickens in her house. So, we’ll come out and find a dead weasel or other animal from time-to-time and clean it out. On rainy nights, when we’re sure everyone else will be under cover from the rain, Shelby spends the night inside (mostly because we worry that she won’t use her house—she’ll guard those chickens no matter what). Animals really are amazing, but only if you let them be amazing. Sometimes, that means working with an animal’s natural instincts to see what is possible. Shelby was bred to herd sheep, but now she herds chickens instead. Not many people would think that possible, but we’ve made it happen with two dogs now and I have no doubt that border collies can work just fine with chickens. Let me know your thoughts on amazing animal behaviors at John@JohnMuellerBooks.com. Not a lot of time is spent in discussing cleanliness in many self-sufficiency texts except to say that it’s important to maintain the cleanliness of the animal enclosures to improve overall animal health and to reap the monetary benefits of doing so. It’s true, keeping the animal enclosures clean does provide these benefits. No matter what sort of animal is in your care, dog, cat, chicken, or rabbit, cleanliness is a requirement if you want to maintain their health. Unhealthy animals are a lot more expensive to keep and you won’t obtain much financial benefit from them. A few texts will stress that animal cleanliness also produces happier animals. Animals tend not to express happiness or unhappiness in the same way that humans do. However, each of our animals does express happiness or displeasure in specific ways. Anyone can see these emotional conditions if they care to look. Animals do feel things and the need to be clean (after a certain manner) is a characteristic that they have in common with us. However, I’ve never encountered a text that stresses that animals have a preference for being clean or that they even have the intellectual resources to determine the difference between clean and dirty. Over the years, we’ve worked hard to keep the environment our animals live in as clean as possible. During that time we’ve also noticed that the animals definitely have a desire to be clean and that they do, in fact, have the intelligence to tell the difference. For example, one rabbit purposely chewed a hole in the side of it’s enclosure to gain access to the middle enclosure of a three rabbit hutch. It was only after I discovered an air leak in the side of the rabbit’s current enclosure and fixed the leak that the rabbit was happy to stay in the enclosure I chose for it. The rabbit was uncomfortable and determined a method for overcoming that discomfort. It’s method of addressing the problem showed a certain level of intelligence. As another example, in cleaning the chicken’s nest box enclosure, some of the bedding gets tromped down, but is still dry and clean. We fluffed up the bedding and added a bit more to ensure the chickens comfort and to keep the eggs from breaking. Other bedding was soiled, and so we put it into the compost heap to decompose. New bedding was put in the nest boxes that had soiled bedding in them. The chickens unerringly chose the nest boxes with new bedding in which to lay their eggs. Since the chickens were outside in their run and didn’t see which nest boxes received the new bedding, we can only assume that they can smell or somehow see the difference between the new and old bedding. However, it’s important to note that they knew the difference and made a choice to use the new bedding, rather than the old, even though the old bedding is still clean and usable. We had three cats at one point. One of the cats had become enfeebled due to old age and was sick. The other two cats would refuse to use the potty pan after the sick cat until we cleaned the potty pan up. 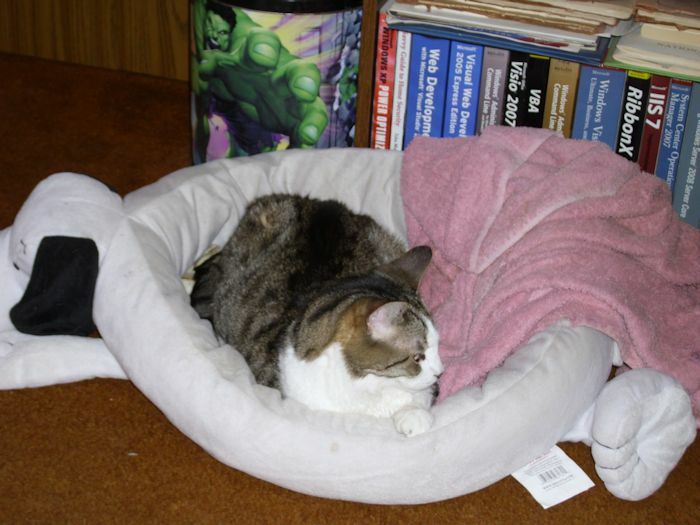 The odor left behind by the sick cat signaled disease and the other two didn’t want to pick up. Even if the potty pan had just been cleaned, the other two would refuse to go into after the sick cat. The cats made a choice. Keeping your animal’s environment clean is therefore more than simply a matter of health or monetary gain. Animals are happier when you keep their environment clean and they do have the intelligence to make choices about their environment, given the chance to do so. It’s the intelligence part of the equation that should grab your attention most. Animals know when their environment isn’t up to par and you should too. Providing your animals with a clean environment is a responsibility that you should take seriously. However, it’s also important to remember that animals don’t use human standards of cleanliness. The essentials are to keep the environment clean and comfortable. A rabbit or chicken is unlikely to want, need, or even accept room deodorizer or other human niceties in their environment. In fact, some human niceties (such as scents) are actually detrimental to animal health in some cases. Make sure you take an animal eye view of environment when you setup, maintain, and clean their equipment. Let me know your thoughts on animal environments at John@JohnMuellerBooks.com. It was an innocent act—incredibly funny, in fact that led me to think about the topic of today’s post. I had recently installed new UPSs for our computers. The addition allowed me to plug the speakers in for my wife’s system. She has a program named Catz installed on her machine. They’re virtual cats, of course, that you feed and pet just like the real thing. The cats will play on screen while you work away. Every once in a while, you can take a break to see them do some of the oddest things you’ve ever seen. 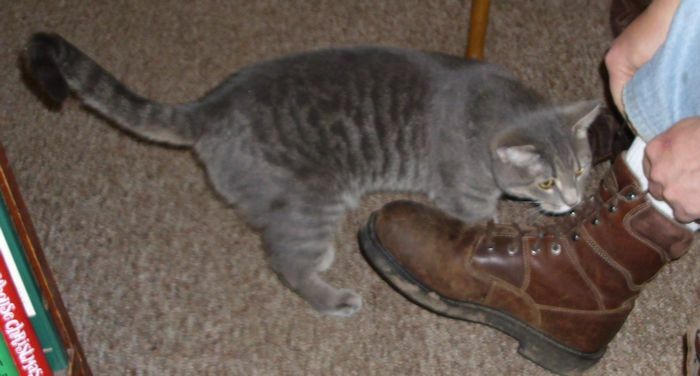 Our real cat, Smucker, hadn’t ever heard Catz before. When he heard them for the first time, he was intrigued. At some point, I walked near my wife’s office and heard the most horrid banging. Naturally I stopped to investigate and there was Smucker, banging on those speakers for all he was worth, trying the get the cats out . The technology you use can produce hilarious events with your animals because the animal has no clue that it’s technology, and not the real world. Over the years our cats and dogs have interacted with animals on TV, tried to make sense of plush toys that also purr, and wondered about our sanity in associating with the vacuum. For the most part, our dogs and cats have been curious, we’ve been entertained, and no one has gotten hurt. I know that technology has had a beneficial affects on our animals in many cases. For example, research into new materials has garnered long lasting and easy-to-clean rubber buckets for our chickens (see Review of Weather Proof Rubber Pan). All of our animals have benefited from the research we perform online—something that wouldn’t have been possible even a few years ago. Technology helps us create better environments for our animals and to feed them better food. The vet that cares for our animals relies on modern technology for shots and general care. In short, our animals have a better life because of technology. However, I also started to consider the negative aspects of technology. When a human plays music too loud, doesn’t it also affect our animal’s hearing? 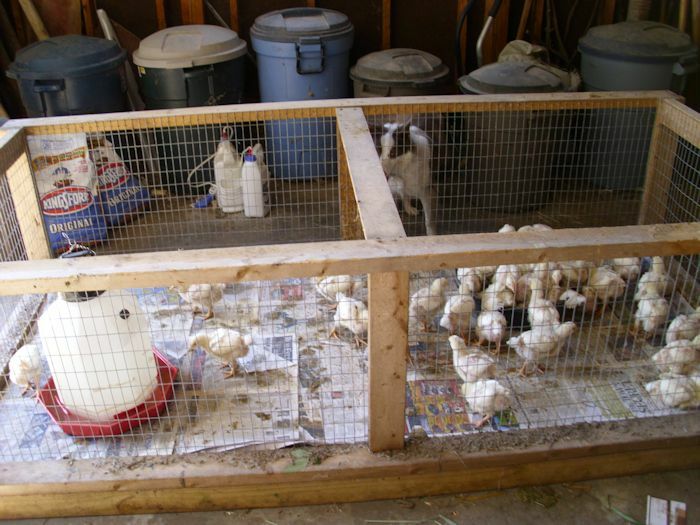 While we put the dogs up when working with yard equipment, the chickens and rabbits remain outside. Does the use of these items affect their hearing and potentially cause other problems? I’ve been spending considerable time thinking about these issues as of late because technology can be a two-edged sword in many ways. Because animals have no way of telling us how technology affects them, we often have to rely on our senses to detect changes in them. For example, the rabbits do get quite nervous when I drive right next to their cage with my garden tractor. I changed that behavior this year and started using the hand mower or my weed whacker—the rabbits do seem a bit less nervous. Sometimes the technology meant for direct use with animals can be harmful too. For example, reading the list of ingredients for some animal food should tell you that the food isn’t truly beneficial. It may be an inexpensive way to feed your animal, but it’s not a good way to meet their dietary needs. We tend to try to feed our animals things they would naturally eat, even though technology says that we really need to use some specially formulated food instead. In fact, we’ve found that we can save money and still give our animals a better life by not following the technological route in this case. We provide our animals with kitchen scraps of all sorts, along with access to grass, insects, and all sorts of other natural foods—none of which costs us a penny, but is healthier for the animal. A major problem for me is that there isn’t a lot of research available on the problems that technology can cause when it comes to animals. As a result, I spend a lot of time seeing how the animals react to the techniques we employ to make their lives better. How is your use of technology affecting your animals? Let me know your perspective at John@JohnMuellerBooks.com. It’s incredibly important to keep your animals cool in hot weather. Just as you need to keep your cool, animals need to keep cool too. The same sorts of heat-related problems that affect you, affect your animals. However, there is one important difference. Unlike you, your animals have no way to communicate that they’re hot. Sometimes people misread the signs until the animal dies, which is incredibly sad. You might think that air conditioning would solve all of your problems. However, I’ve noted that some animals, like some people, don’t do all that well in air conditioning. So, besides being incredibly expensive, you could end up doing your animals more harm than good. There are better options for keeping your animals cool. Water, lots of it, is an essential element in keeping your animals cool. The water should be kept fresh at all times, which means changing the water three or four times a day for most animals. It helps to put the water in some sort of bucket, instead of a water bottle. Yes, the bottle does keep the water cleaner, but the animal can’t access the water when you put it in a bottle. Think about your methods of keeping cool. When you want to stay cool, just drinking water doesn’t do enough most of the time, you want to put a little on your body too. Animals like to have water for more than just their drinking needs too. Cats seem to be the least affected by heat in our experience. You need to allow them a cool place and lots of water. Don’t be surprised if you find the cat lying in the bathtub, on the shower floor, on your tiles, or anywhere else there is a smooth cool surface. Placing the water near this surface means the cat expends less energy finding something to drink. Cats will overheat rather than splash water on themselves. Sometimes you need to give them a helping hand (hoping that they don’t scratch too much in the return). Cats prefer cool, not cold, water. Running water (as in one of those bubbler bowls) is better than stagnant water. Dogs seem to like a bit of a breeze and copious quantities of water. Sometimes our dogs will lie right in front of a fan in order to grab some breeze. Many dogs also love ice. We’ll put ice in their water bowls to get the water ice cold. Our border collie is especially adept at grabbing ice cubes and grinding them up. A big issue is keeping your dogs quiet in hot weather. A dog will hurt itself, rather than disappoint master. Master needs to understand that and keep the dog as quiet as possible. Misting your dog does seem to help. In fact, I don’t know of many dogs who don’t enjoy getting completely wet during hot weather (try one of the many dog pools available on the market). Some dogs don’t do well in air condition. I know that our beagle gets a sinus condition from the air conditioner. Rabbits do well in air conditioning for the most part and we’ll bring our most vulnerable rabbits inside during especially hot weather. Bucks need the cooling more than the does do (a buck can become sterile if he gets too hot). Younger rabbits need cooling more than older rabbits. It’s essential that you not keep rabbits together during extreme heat. For some odd reason, they’ll pile on top of each other—hastening the inevitable. We’ve tried freezing drink bottles (mostly full of water with a little air gap at the top) and placing them in the cages. It works quite well. The rabbits will lie next to the bottles and use them for cooling. Expect to go through a number of these bottles. The rabbits also seem to delight in chewing holes in the bottles. Chickens apparently don’t sweat. They actually fan out the feathers to allow for cooling and will pant much like a dog does. We’ve tried misting the chickens with mixed results. However, we have discovered that chickens will cool themselves by wading in cold water, leading me to believe that chickens cool themselves through their feet. Spraying the feet also seems to have a good effect. Once I discovered that chickens hate to get their feathers wet, but delight in cool feet, I was able to redirect the spray from a hose to more effectively cool them. We have also employed fans to help the chickens cool themselves. They’ll sit in front of the fan, feathers fluffed, gathering as much of the breeze as possible. Chickens don’t seem to do well in air conditioning. Chickens do need more fresh, cool, water than most animals do and expect that water to get quite dirty between refills. The one constant that we’re finding is that eating generates heat. We’re finding that withholding food until the evening hours seems to help every animal we work with to stay cooler. In fact, chickens will often die immediately after a meal when the weather is too hot from a heart attack (a condition known as flip). Wait until evening, when it’s cooler, to feed your animals during the summer and you’ll keep them a lot cooler during the day. As an alternative, try feeding your animal in the extreme morning hours (before the sun rises, if possible). Don’t feed your animal during the hottest hours of the day. The point is that you must discover how your animals get cool. Each animal will also have personal preferences. Observe your animals closely to ensure it stays cool in a way that works with its body type. Some animals like misting, others don’t. Some can tolerate air conditioning, others can’t. Water is always a primary ingredient to keeping your animals cool and making that water accessible is incredibly important. The number one thing we’ve found out though is that animals will also try to tell you in a non-vocal manner when it doesn’t like the manner of cooling you’ve chosen. Find something that works. Let me know about your experiences with animal cooling at John@JohnMuellerBooks.com.